I spent this past weekend at school for a couple of reasons, one of which was Deep Roots. For those of you unfamiliar with the area, Deep Roots is an all-day event downtown with food, games, vendors, drinks, performances, and live music. It’s basically the most exciting thing to happen to this town all year. I spent a whopping four hours at Deep Roots with my boyfriend, friend, and roommate. 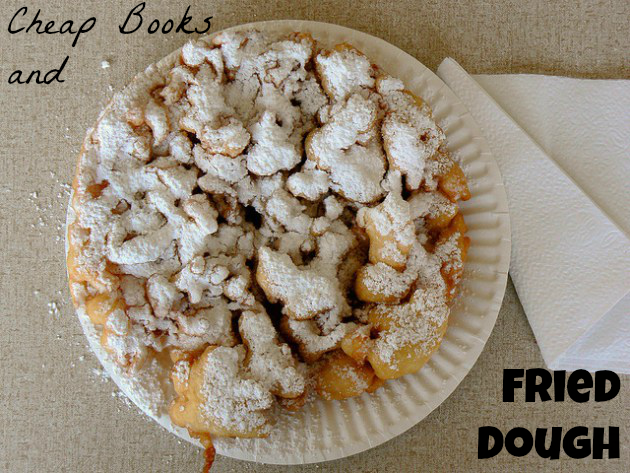 While the four of us were out, we watched a STOMP-like performance, danced in a flash mob rendition of “The Time Warp” from Rocky Horror, bought over a dozen books, chowed down on funnel cake, and had a fantastic time. If you like to read, let me tell you about the awesome deals I got on books. Have you spent much time at antique or thrift stores? Maybe you’ve noticed that these places also sell books. These books are CHEAP. I picked up twenty for only sixteen dollars. How cool is that? Also, I’m sorry if I made everyone crave funnel cake. Luckily, I found a recipe that you can try out at home! While you’re reading that post, follow that blog. It’s fantastic. All in all, I had an excellent weekend. What about you guys? What did you do?